Restaurants come and go quickly in Joo Chiat, and it’s easy to miss a gem like Javanese diner Djanoer Koening when it comes along. Named with the old spelling for the phonetical janur kuning – a young yellow coconut leaf – its dated façade and simple interior mean it barely stands out from the area’s ramshackle eateries, many in oft-vacated shophouse spaces. The decor is kitschy but authentic, from the batik on the wooden tables to the dish shots slapped in the glass façade and the mismatched shades of wood, all of which recall Indonesia’s rumah makans (‘eating houses’). Specially printed banners on the purple walls tell of the culture of Jogjakarta, the city from which most of Djanoer Koening’s food originates. 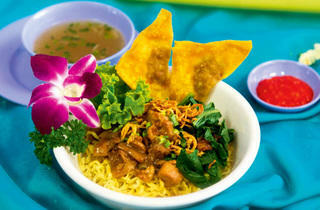 Though ‘Jogja’ features prominently, there are dishes from across Java, too. It’s a family business, led in the kitchen by Javanese Ibu Wir (Suharmi Wiryatmoko), the wife of a former chef at Hilton Singapore. The team of four cooks offers a tight, tick-off menu of 23 items across the board, excluding specials. Their dishes burst with flavour, though the taste comes from boiling down bones rather than using MSG – a big move given that Miwon MSG is ubiquitous in Indonesia. The perkedel kentang (potato and chicken cutlet) is faultless – a fine, fluffy mash of potatoes and well-ground chicken meat, dipped in egg and then shallow-fried. Oseng-oseng mercon (stir-fried sweet and spicy beef) isn’t as fiery as the native versions (mercon means ‘firecracker’), but it’s a well-balanced mix of lean and fatty beef in a glistening, sweet and spicy sauce flavoured with chillis, lemongrass, slightly sour daun salam (Indian bay leaf) and unyielding petai (stinking beans). The smell and texture make this dish an acquired taste. The stone-cooked quarter of grilled duck is a more obvious crowd-pleaser, brushed with a blanket of sticky-sweet black sauce. Its smokiness is given a bright lift when it’s dipped into the accompanying thin sweet sauce, enhanced with kaffir lime leaves and chillis. Another comfort dish is the bakso urat soup, with two types of noodles, which stars big, soft, bouncy beef balls with a rotund bovine flavour. If these dishes are too ordinary (and if you’ve got lots of mates), place an advance order for the party-sized cone-shaped nasi kuning ($250-$425 for 20-50 people) – a kind of Indo equivalent of birthday cakes, this savoury assorted celebration dish is centred around yellow rice. 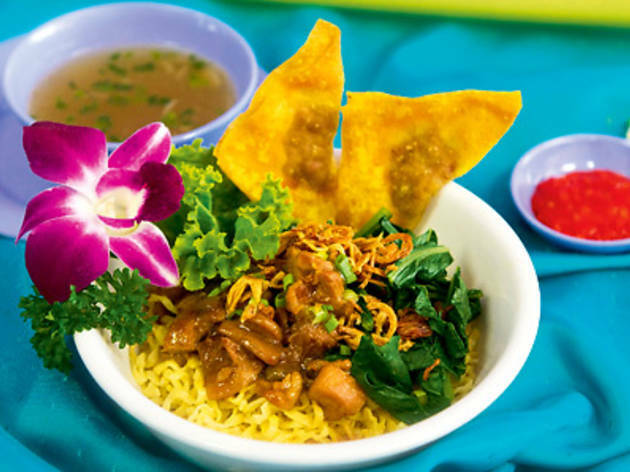 The absence of the MSG is most pronounced in the soto ayam Magetan (chicken soup with rice): usually sharp and thirst-inducing, the clear, turmeric-spiked chicken soup from eastern Java is a calmer, healthier version. But the flavours remain in the umami-laden, citrus-weaved broth laced with garlic, ginger, candlenut and pepper. If even a little salt grates your kidneys, tap water is complimentary, and shaved ice desserts come served in tall plastic parfait glasses. Differing only by a couple of ingredients, the es teler and the es doger are coconut milk-based and filled with coconut strips, medium-ripened avocado chunks, the jelly-like nata de coco and – when available – jackfruit. The latter has the addition of preserved palm seeds, rose syrup and fermented tapioca (tastes and feels like juicy mangosteen flesh). Neither these nor the smooth, milky avocado juice are as sickly-sweet as the indigenous versions, yet remain true to their origins.